“Schedule emails” means that you do not want to send the prepared emails right now, and replaced to send them in the future, such as Thur. 16:00 of next week, or 1st 09:30 of next month, etc. And the scheduled time for sending emails can be an exact time, e.g. Aug 09, 2018 13:45, or a variable/periodic time, e.g. Fri. 18:30 for every week. Besides, as you think, you need some prepared emails for scheduling, such as receivers, subject, content, etc. And other important thing is, need a sender (email account). Why need to automatically send email? Remind yourself or others something important. Submit the daily work logs or documents to your manager. Send the routine business eMails. Periodically introduce your product / service to the potential customers by emails. Greet your families or friends at the important days, e.g. birthday. As above, some purposes are for avoiding forgetting, some are for reducing your workload. If you have such these requirements, you should have a handy email scheduler. 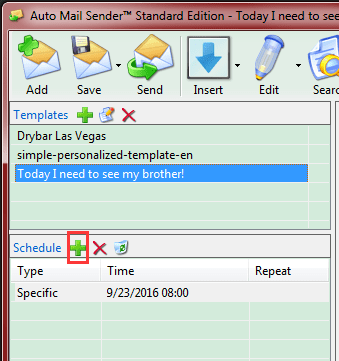 How to send delayed email by Auto Mail Sender™ Standard Edition? Screenshot A: scheduling types to automatically send email. Now explain how to get automatic email sending by using it, step by step. Step 1: download the official version of AMSSE, install and run it. Download AMSSE to know how to send delayed email! Step 2: click <Steps> button on the toolbar, it will guide to create your first email account for sending, and then create an email (template), save it. Step 3: select the template, and then click the plus icon near the Schedule list, you will see the Schedule setter like above interface. Screenshot B: open automatic email sending setter. Step 4: on the Schedule setter, specify the sending time as you wish, and then click <Add> button, you can set one or more schedules for the selected template. And then, nothing needs to do, AMSSE will send the scheduled emails follow your order. Which types of scheduling are supported in AMSSE? Please note that the date time format is relied on your system settings, also friendly! AMSSE is a Windows software, if you want to use it on Mac computer, you can use a Windows emulator like Parallels Desktop. To get the scheduled emails sending out, please keep AMSSE running. Usually, our clients install it on their server. P.S. it is set to automatically run by Startup menu.